What do you know about Marcos? (SPOT.ph) Martial Law, imposed by former President Ferdinand Marcos from 1972 to 1981, has become an abstract idea especially for today’s youth. The atrocities of that era have become largely invisible, buried by both time and secrecy much like many of the victims of these state-sanctioned crimes. 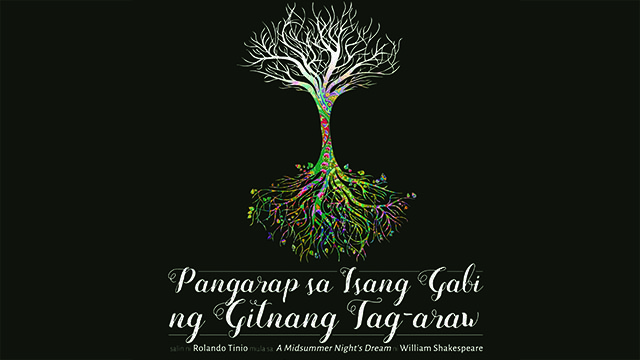 In an effort to create awareness on that dark period’s martyrs, the people around the victims, and Martial Law’s impact on the Philippines even up to today, Ladies Who Launch stages nine one-act plays grouped into sets of three at the Bantayog ng mga Bayani Amphitheater in Quezon City. 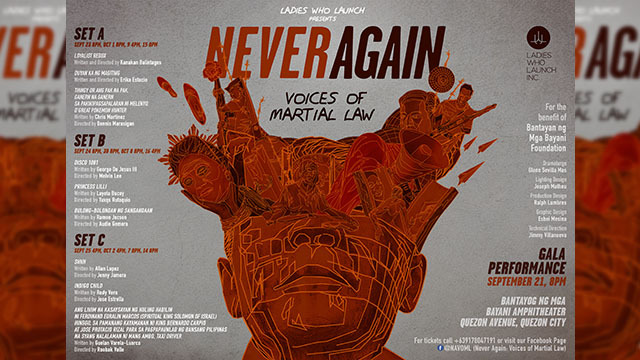 The festival titled Never Again: Voices of Martial Law starts with a gala performance at 8 p.m. on September 21, the same date that the dictator signed Proclamation No. 1081 or the declaration of rule by military power. It is for the benefit of the Bantayog ng mga Bayani Foundation, which honors the martyrs and heroes of the struggle against dictatorship in the Philippines. Joining the cast are theater veterans Pinky Amador and Lou Veloso. 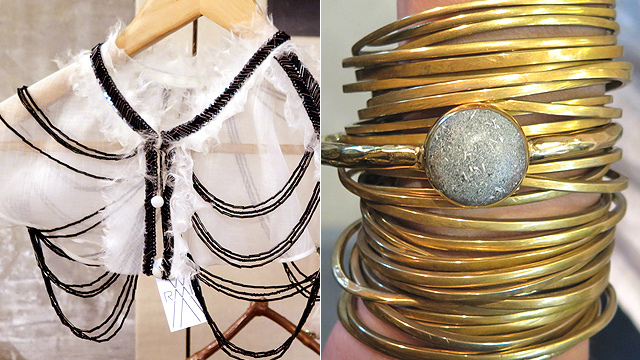 “Our goal is to unearth these stories and make them visible, visceral, and palpable. We want those alive today to remember the victims as people, not just as statistics or bios on a website. Above all, we want to ensure that the evils of Martial Law are never forgotten, never repeated,” said Ladies Who Launch Inc. in a press release. They also lament the fact that “we have, as a nation, already begun to forget.” Imelda, Imee, and Bongbong Marcos have all been elected into public office. “Most importantly, we are seeing a growing sentiment that devalues human rights, the rule of law, and democracy in the public today as a result,” the group continued. To add to this is the imminent burial of former President Marcos at the Libingan ng mga Bayani. Never Again: Voices of Martial Law aims to educate Filipinos on the horrors of the Marcos dictatorship—not just millenials, but their parents as well who were there but were shielded from the grim realities of Martial Law. September 23 (Friday), 8 p.m.
October 1 (Saturday), 8 p.m.
October 9 (Sunday), 4 p.m.
October 15 (Saturday), 8 p.m.
First staged at the Virgin Labfest 2016 as Loyalist, Loyalist Redux looks into the political irreconcilable differences between a Marcos apologist mother and her activist-artist son. Imelda's return to the Philippines makes headlines and a bag of worms from the past is opened up like Pandora's Box. This tragic one-act play tells the story of how activists and patriots Lorena Barros, Macli-ing Dulag, and Edjop and Evelio Javier endured and perished in the hands of their torturers and murderers. In May 2016, Twitter user @zappybands posted "Mababait ang mga Marcos, some people don't just see it because they focus on the Martial Law thingy." The last three words immediately represented the mindset of the misinformed youth despite the availability of information right on their fingertips. Thingy Or Ang Pak na Pak Ganern na Ganern sa Pakikipagsapalaran ni Melenyo, D’ Great Pokemon Hunter features two characters—the clueless millenial and a combination of all the other personalities who reacted to the said tweet. September 24 (Saturday), 8 p.m.
September 30 (Friday), 8 p.m.
October 8 (Saturday), 8 p.m.
October 16 (Sunday), 4 p.m. The mid-1970s saw the rise of disco, a genre of dance-oriented pop music that blends elements of funk and soul, in the Philippines. One night, student activists meet at a local club to celebrate their friend's 18th birthday. It is a turning point in their lives as they decide if they should leave the movement or not. Sarah, a 10-year-old with a vivid imagination, loves reading fairy tales and happily-ever-afters to escape her troublesome childhood. She talks to Princess Lilli and we find out that the Martial Law era was never a fairy tale. Construction workers billeted at a construction site, away from their families, discuss their daily struggles as below minimum wage earners from the days of Martial Law to the present. September 25 (Sunday), 4 p.m.
October 2 (Sunday), 4 p.m.
October 7 (Friday), 8 p.m.
October 14 (Friday), 8 p.m.
On a rainy day in 1977, Kim and Mark talk about a friend who went missing. They remember what he's like, his outspokenness, where he could possibly be, and contemplate whether they should help in the search. They also talk about Imee Marcos. Mark finds her hot, Kim says she is kind. Felisa, a rebel caught, tortured and raped is committed to a halfway house as the new millennium breaks. Her son, Jerome, now 20, has been taking care of her since his teens, after she is diagnosed as bipolar due to multiple traumas. Mang Ambo is a taxi driver and evangelist of the cult of Ferdinand Marcos. One day, a journalist rides his cab and he starts telling her the true story of how the dictator is actually the future King Solomon of the Philippines. 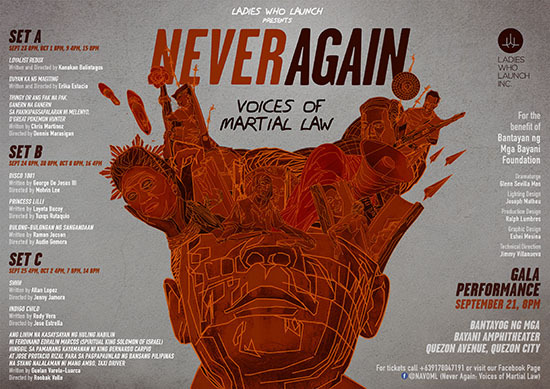 Never Again: Voices of Martial Law runs from September 21 to October 16 at Bantayog ng mga Bayani Amphitheater, Bantayog Road, Diliman, Quezon City. Tickets are priced at P500 per set and festival passes are priced at P1,300. For inquiries, contact 0917-804-7191 or visit Never Again: Voices of Martial Law's Facebook page.